Celebrate your special day with a photo book! A photo book is the perfect place to capture the magic from your wedding day, and treasure those memories. 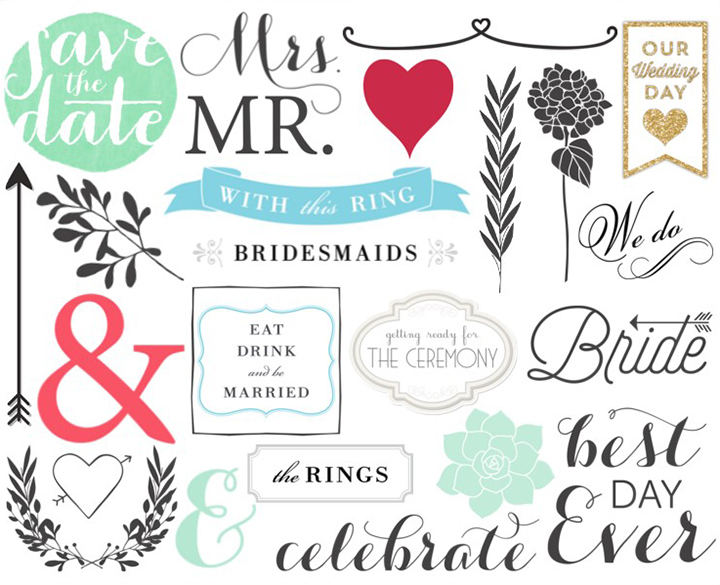 All featured embellishments can be found in the Wedding folder. We’ve chosen some of our favourite Wedding embellishments to share with you! The Wedding embellishment folder includes; ‘Engagement’, ‘Wedding’, ‘Honeymoon’ and ‘Anniversary’. You could create a photo book of your journey as a couple, starting with the engagement and ending with the honeymoon, or just focus on your big day! We’ve created a range of photo book spreads, using various Wedding embellishments and text to help inspire you! TIP 1: Layer your images! Spread an image across both pages, and layer a different image on top! 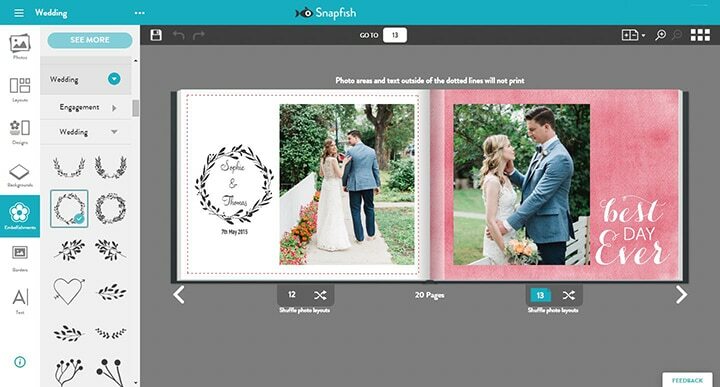 It ties both pages together perfectly, and also allows you to show off some of your fave photos! TIP 2: Mix embellishments and text! In this example, we have used a wreath found in Wedding embellishments, and added some simple text. We used Mahogany Script for ‘Sophie & Thomas’, and DIN 1451 Engschrift for the date. The result if a beautiful way to commemorate the happy couple 💕. Another way to connect the spread, is to match the colour of an embellishment with the colour of the background. You can see in this example, we have matched the blue from the ‘with this ring’ embellishment with the bright blue background colour on the opposite page. Or you can keep it simple like Hannah from Crafternoon Caberet Club who created the ultimate coffee table photo book with wedding photos! If you want to keep learn more about embellishments? We’ve also created some inspirational tips for basic embellishments and travel embellishments. Tagged as ideas, photo book, tips, wedding embellishment.